Home › News & Events › PAU Ph.D. Student Elizabeth Choi Receives Two APA Awards! PAU Ph.D. Student Elizabeth Choi Receives Two APA Awards! Elizabeth Choi, an international student in her third-year of the Ph.D. program with a focus in neuropsychology, was awarded two separate student research awards from the American Psychological Association (APA). Both awards were presented during the APA 2018 Convention, which took place in August at the Moscone Center in San Francisco. Students rarely win more than one APA research award in a given year. Submissions are selected based on the quality of the research and the fit with the mission of various APA divisions. Both awards were for her research titled, “Ethnicity Moderates Subjective Caregivers' Ratings of Cognition on Objective Performance in Dementia.” As reported in our August newsletter, Elizabeth received a Blue Ribbon Student Research Award from the APA Division 40, the Society of Clinical Neuropsychology. 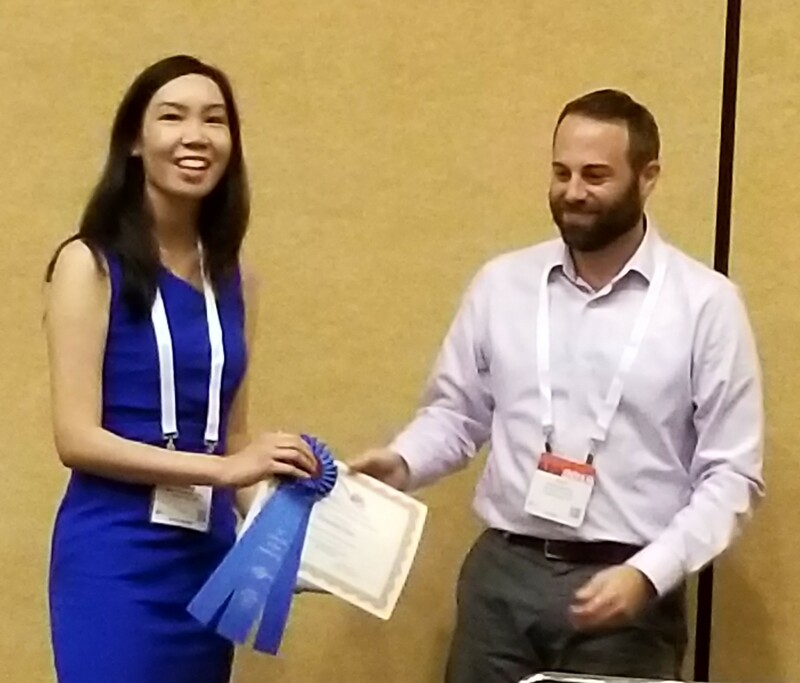 The second award, the APA 2018 Division 12 Section VI Student Research Award, was bestowed by the Clinical Psychology of Ethnic Minorities. Elizabeth’s research reveals that subjective complaints are potentially influenced by idioms-of-distress or culturally-mediated perception of dementia. Although no significant differences were found in objective performance across groups, the study found Latino caregivers tended to report lower severity of memory problems than other groups. Also, ethnic minority caregivers’ perception of care recipients’ cognition was less correlated with objective memory and executive functions test performances, as compared to Caucasians. ““The findings highlight the importance of providing psychoeducation of dementia symptoms to caregivers in ethnic minority groups to overcome barriers of reporting, and to reduce stigma. Elizabeth is interested in studying the assessment and biological, psychological, and cognitive predictors of neurodegenerative diseases (e.g. dementia) and neurological conditions (e.g. epilepsy, neuro-oncology). She is also interested in looking at how culture shapes brain functioning. She plans on embarking on both research and clinical careers in medical/academic settings where she can serve people who are suffering from brain-related disease with great knowledge and care. She is currently a practicum student at the Palo Alto VA Health Care System Neuropsychological Assessment and Intervention Clinic, and also a research team member of the Brain Stimulation Lab at Stanford University.